With big data gaining traction in IT industry, companies are looking to hire competent hadoop skilled talent than ever before. The best way to understand about the different technical professionals working with HDFS, MapReduce and the entire Hadoop ecosystem is to have a look at various Hadoop job descriptions -which is a mixed bag ranging from developers to data scientists. Many students or professionals are concerned about acquiring expertise in different hadoop components and this list of job titles for hadoopers will help them make the right decision by assisting them in choosing the desired job role as a Hadoop expert. If the question is, does the certification make a difference in getting job as a Hadoop developer, Hadoop Architect or a Hadoop admin - here is the answer. Yes, the industries are looking for skilled professionals. 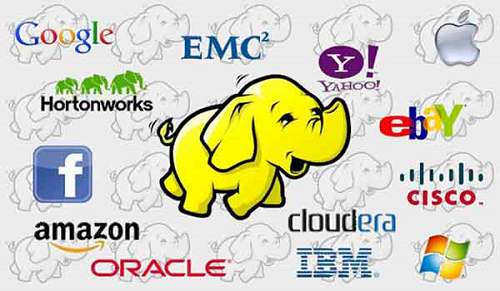 Hadoop jobs are highly lucrative and it comes with a price of knowing the technology in depth. 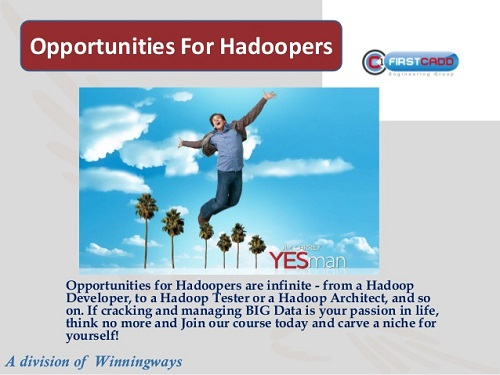 An industry in big data, if seen with a top down approach to understand the Hadoop jobs offered, we can tear it down and say, that at top we find Hadoop Architect’s job who designs how the system should work. Later, Hadoop Developer's job is to actually write programs and bring the visions of Hadoop Architect to reality. And then there is testing, considered last but an important job. A Hadoop Tester’s job is to take care of all the checks to make a piece of code stable as possible. As of March 2014, there were more than 17000 Hadoop jobs advertised online. According to Shravan Goli, President of Dice.com, "The hiring demand for Hadoop professionals is up by 35% when compared to 2013." A research by MarketsandMarkets estimates that Hadoop and Big Data Analytics market is anticipated to reach $13.9 billion by the end of 2017. The growing enterprise importance in Hadoop and other big data technologies like Hive, Pig, HBase, MapReduce, Zookeeper, and Hcatalog is driving demand for increased number of Hadoop developer jobs and Hadoop administration jobs with healthy paying premiums. It is not just the tech companies that are offering Hadoop jobs but all types of companies including financial firms, retail organizations, banks, healthcare organizations are on the verge of driving demand for high paid Hadoop jobs. There is increased demand for Hadoop developer jobs and Hadoop administration jobs amongst start-ups who are building Hadoop directly into their business plans. With the entire focus on “Big Data” today, employers are commonly on the hunt for Hadoop skilled talent than ever before. If you browse any of the job portals such as Dice.com or Glassdoor.com, you will find thousands of Hadoop job openings and other related big data technologies. Companies like EMC Corporation, Apple, Google, Oracle, Hortonworks, IBM, Microsoft, Cisco, etc. have several Hadoop job openings with various positions like – Hadoop Architects, Hadoop Developers, Hadoop Testers, Hadoop Administrators and Hadoop Testers. With large number of IT organizations tapping the technology to store and analyse Exabyte’s of data such as social media content, browser cookies, weblogs, click stream data to gain deeper insights about the preferences of their customer- Hadoop developer jobs and Hadoop admin jobs are growing in number. One of the most common questions I get asked is "What are the various Hadoop jobs available". Here is a brief overview on the various Hadoop job descriptions. Our faculty has clearly outlined what are the Hadoop job descriptions available in the following video. It is an excerpt of one of our recorded sessions from the Hadoop Developer course. Incase you cannot play the video, you can read the various Hadoop job descriptions below. Hadoop developer responsibilities involve actual coding/programming of Hadoop applications. Ideally the candidate should have at least 2 years of experience as a programmer. Hadoop developer roles and responsibilities are synonymous to a software developer or application developer - refers to the same role but in the Big Data domain. Hadoop Developer is a consultant with prior experience in building and designing applications using procedural languages in the Hadoop space. Most of the job portals like dice.com, monster.com define Hadoop Developer Job Description as “A person comfortable in explaining design concepts to customers as well being capable of managing a team of developers." A listing in glassdoor.co.in from dare VMware for the position of senior Hadoop developer goes with the Hadoop developer job description as follows. Hadoop developer must possess strong design and architecture skills. Ability to architect big data end to end solutions and the Hadoop developer should have clear and strong hands on experience. Hadoop developer job also includes delivering solutions using an agile development model, understanding and working to come up with solutions to problems, design, architect and strong documentation skills. Support MapReduce programs running on the Hadoop cluster. 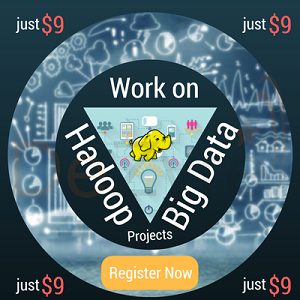 Get Big Data Hadoop Certification to land a top-notch gig as a Hadooper! A Hadoop architect roles and responsibilities include planning and designing next-generation "big-data" system architectures. He/She is also responsible for managing the development and deployment of Hadoop applications. Must have subject matter expertise and hands on delivery experience working on popular Hadoop distribution platforms like Cloudera, HortonWorks, and MapR. The Hadoop Architect Job Description defines the link between the needs of the organization, thee big data scientists and big data engineers as the Hadoop Architect is responsible for managing the complete life cycle of a Hadoop solution. Designing he technical architecture and application design. Deploying the proposed Hadoop solution. A Hadoop tester's role is to troubleshoot and find bugs in Hadoop applications. 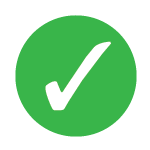 Like in any software development lifecycle, a tester plays an important role in making sure the application is working as expected under all scenarios. Similarly a Hadoop Tester makes sure - the MapReduce jobs, the Pig Latin scripts, the HiveQL scripts are working. Responsible for constructing positive and negative test cases in Hadoop/Pig/Hive components to arrest all bugs. Hadoop administration includes ongoing administration of the Hadoop infrastructure. Capacity planning and screening of Hadoop cluster job performances. For lack of a better term - Data Scientist is believed to be the "Sexiest" Hadoop job description of the 21st century. Data scientists thrive on solving real world problems with real data. They are very good at using different techniques for analysing data from different sources to help business make intelligent decisions. They need to have both skills of a software engineer and an applied scientist. Plan and Develop big data analytics projects based on business requirements. Contribute to data modeling standards, data mining architectures and data analysis methodologies. Did you decide to learn Hadoop?